Ford plans to implement the capless fuel filler intakes it first introduced in the production Ford GT supercar on all it’s vehicles beginning with the 2008 Lincoln MKS, though details on exactly in how soon the change will be implemented across the model range are sketchy. The image on the left shows the flap which covers the fuel tube, which opens under pressure from the gas pump nozzle. The “Capless Fuel Filler” flap, called Easyfuel, will fit snugly around the nozzle to prevent fumes from escaping while the car is being refilled. Ford says this will solve the problem of drivers forgetting to replace the gas cap after refueling. These caps are often left at the petrol stations, on the boot, on the roof, or dangling from the cars as they drive away. Those left on the boot and roof usually fall off. I have actually made this mistake once in my life, 2 weeks after I got my driving license, LOL! Ford’s research have also shown that some drivers dislike touching their fuel cap and getting the smell of fuel on their hands. 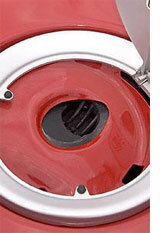 It would also remove the need to unscrew the fuel cap, which can be a pain for people suffering from arthritis.